The smallest boat in the fleet; a beamy but compact pram dinghy with a spacious interior, she offers overnight accommodation for the single-hander when a tent cover is fitted. Sails well with her twin bilge keels, rows well, and tows well. Shoveler is, like the duck for which she is named, most at home in lakes, ponds, rivers, and the upper reaches of tidal estuaries. She is a flat-bottomed pram dinghy with the unusual feature of twin bilge keels instead of daggerboard or centreplate, and this gives her a remarkably roomy interior for a boat of her compact overall dimensions. She is light enough to be carried on the roof of the average family car. Shoveler has comfortable sprawling space for two adults, but if tented over makes a minimum cruiser for the single-hander. 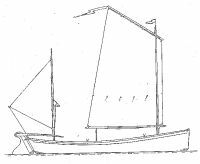 Her long bilge keels give her the feel of a much bigger boat; she tacks well under oars or sail, and goes to windward in very shallow water with her endplate rudder. Construction is similar to other boats in the range – (6mm) plywood is the hull material, and only three sheets are needed. Rigidity is provided by the solid gunwales and chines, with buoyancy built in fore and aft. She can be easily rigged with a lugsail or spritsail, perhaps boomless for simplicity and to spare the crew? heads! A small outboard can be clamped to the transom. A simple but roomy scow hull, only weighing 111kg (244 lbs), gives a lot of boat in a compact space. 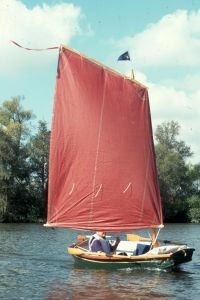 Spoonbill can be sailed, or used with a small (electric or petrol) outboard motor as an open launch with loose chairs. 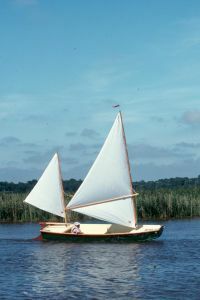 Spoonbill has a flat-bottomed scow hull (with a bow transom), with easy lines for good sailing and simple building with no hard bending – like her sisters, she is put together without any need for moulds, jig, or building frame, from pre-cut panels and prefabricated frames using readily-available materials. Five sheets of plywood, preferably marine, are needed for the basic hull structure – two of 3/8″ (9mm) and three of 1/4″ (6mm). Frames and longitudinals are made up from hardwood or softwood. Spoonbill is intended as a dual-purpose vessel. She sails well with the recommended sprit-boom rig shown, but the transom will accept an outboard motor and her completely open interior can be fitted out with loose chairs as a river launch, ideal for sedate family outings or fishing trips. An electric outboard is the ideal means of propulsion. 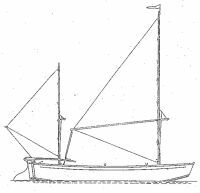 Under sail, her ability to go to windward comes from her two long 3″ (76mm) bilge keels, which also give her excellent directional stability. With an overall tent cover, there is ample space for two people to sleep in comfort; being flat-bottomed, the boat can readily be run ashore for a peaceful night. Buoyancy is built in beneath the bow and stern decks, and should enable Spoonbill (like her sisters in the range) to comply with the requirements of the EC Directive on Recreational Craft if necessary. Illustrated instructions are keyed to the plans. 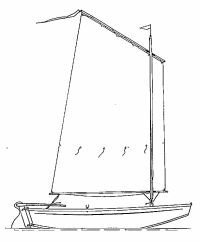 A pure rowing version of the sailing skiff Sandpiper, Little Grebe follows the same style and methods of construction, with slightly reduced beam and freeboard: she is an elegant and stable boat for relaxed and enjoyable recreational rowing, or freshwater angling. 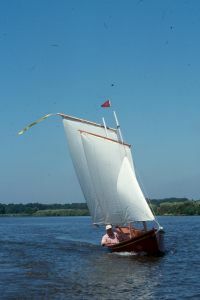 Little Grebe is (despite her handsome appearance) designed for exceptionally quick and economical building: apart from the solid timber needed for framing and longitudinals, all her hull components can be cut from three sheets of 3/4″ (6mm) plywood, though construction can be slightly simplified (and appearance enhanced) if transom and thwarts are made up from varnished hardwood. 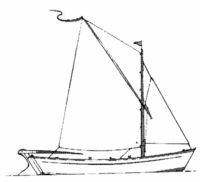 As with the other boats in the range, building requires no special equipment or skills and presents no problems to the single-hander. There are two rowing positions, though with two people at the oars a passenger on the stern seat is desirable for good trim. A single rower will find Little Grebe fast and responsive, tracking well and with excellent stability thanks to her flat-bottomed design, which also makes her a good choice for the fisherman. Her shapely form will allow her to take her place among any group of craft at a Thames-side picnic on a fine summer’s afternoon.